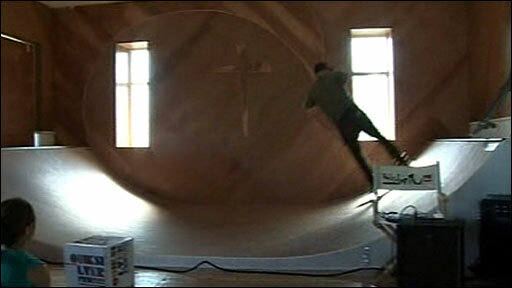 A Methodist Chapel in Cornwall has come up with a novel way of broadening its appeal by building a skate ramp inside. 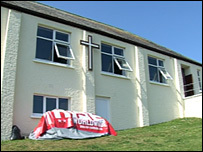 The chapel at the surfing resort of Polzeath is hoping a younger generation of worshippers will get off the beach on Sunday mornings and into church. Out has gone the pulpit and communion table and in has come a plywood-formed half-pipe at the Polzeath chapel, now renamed the Tubestation. And it all has the blessing of the local Methodist Minister, Gareth Hill. He said: "We had been looking at ways of speaking to the generation of skaters and surfers and we thought 'let's go for it'." "The chapel has been changed in every sense and mainly because now we're full." He said members of the church had backed the idea which includes an internet cafe and screens surf and skateboard videos. "Those that are involved with the church have loved it," he said. "But then we are a very forward thinking congregation." On Sunday Christian skaters Jared Lee and Tom Geilfus from the US skated to a rock music backing and an enthusiastic audience at the morning service. 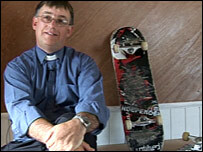 Mr Lee, of the Untitled skateboard team, said: "Churches are needing to reach out to a new generation. "This is what God wants, to be relevant." Mr Geilfus said: "Skateboarding goes hand in hand with faith. "When you step on a skateboard you are putting your trust in your skills. It's the same with faith when you step out you are putting your trust in God to tell you what to do." But for those with more traditional beliefs, skating, loud music and church do not mix. Visiting worshipper Joy Thorogood said: "I don't agree with it. "This is God's house, where he needs to be worshipped." Organisers admit there have been a few raised eyebrows, but, with attendances rocketing, the half pipe has brought about a full church. The ramp was built with the help of a £1,240 grant from North Cornwall District Council, provided through a community fund for young people.